← Revolution, award winning movie the world has been waiting to see! One of the most misunderstood animals in the world is the pig. Pot bellied pigs are clean, intelligent and devoted beings. 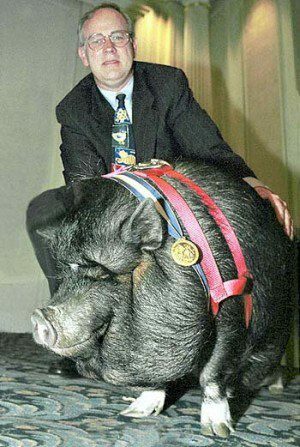 Lulu the pot bellied pig showed the world just how loving and heroic the unsung pigs of the world could be. A woman named JoAnn was pig-sitting Lulu for her daughter and the two developed a friendship. Everything was going fine when suddenly JoAnn suffered a major heart attack and fell to the ground unable to move and unable to get help. Knowing that her life was in danger, JoAnn called for help but no one could hear her. Lulu somehow also knew her friend’s life was in danger. She ran out of the house to find help. Unable to find anyone to help, Lulu ran into the middle of the street and laid down, stopping traffic. Passersby paid no attention to the frantic pig but Lulu refused to give up. She returned to the house several times to check on JoAnn but kept running out of the house to find help. Finally someone noticed something was wrong and followed Lulu back to the house and called 911 for JoAnn. The paramedics rushed JoAnn to the hospital and she survived. JoAnn enjoys life everyday thanks to the heroic acts of one loving pig. Lulu was honored with the ASPCA‘s Trooper Award for bravery.